And that, explains Georgetown University linguistitcs orofessor Deborah Tannen writing for Time, is why hardly anyone really likes Hillary Clinton, even though plenty of loyal Democrats plan to vote for her in November: Hillary is in a “sexist double bind”! We all know that Hillary has a “male-voter problem,”–and also a “female-voter problem”–but as Tannen tells it, the reason is that no matter what kind of look Hillary chooses–or what kind of speech style she affects–she’s bound to make some choices that people don’t like. So it’s damned-if-you-do and damned-if you don’t when Hillary’s faced with the choice of donning that tangerine pantsuit with the matching tangerine blouse. And that’s because she’s a woman! 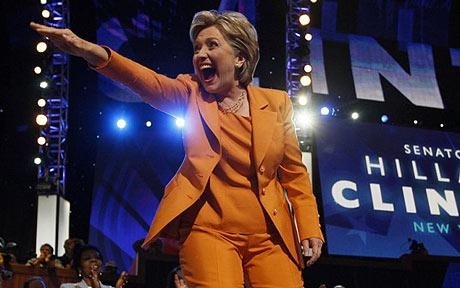 No one expects a man to wear a tangerine pantsuit! And those “less comfortable” shoes must be why Hillary made a sourpuss face when some meanie from the press asked her about her home-based e-mail server that seemed to be the repository of so many classified documents. Nice gloss by Tannen. Hillary’s problem is that she has no clothes. Did they pay that “professor” for that load of tripe? 1) Are we really ready to elect a president who has to spend so much precious POTUS time on picking out her wardrobe and doing her hair and makeup? 2) How come just about every picture of Hillary I’ve seen shows her looking stupid with her mouth wide open? I wonder what the cumulative effect of that will be come November.